Thomas Booler was born on 15th September 1825 and baptised in the parish church of Snelston, Derbyshire (1). It was in that year that the parish church was substantially rebuilt (2). Thomas was born out of wedlock to Hannah Booler and Thomas Froggatt, but there is census evidence to suggest that Hannah and Thomas wed at a later date. Thomas joined the Army – the Corps of Royal Sappers and Miners – in about 1848. 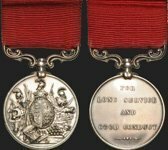 Thomas was quartered in the royal palace at Kensington in 1851 along with other sappers, albeit under the name of ‘Henry’ Booler (3); an exciting event was underway: the 1851 Great Exhibition, at which Thomas was awarded a medal and prize. There is no other information about Thomas’ Army career as he did not discharge to pension and thus no Chelsea Pension documents are extant. It is possible to calculate from other sources that he served as a Sapper for 12 years, more than eight of these in Western Australia from 1851 to 1860. Thomas Booler arrived at Fremantle on the Anna Robertson on 18th December 1851 with 65 RSMs, two Lieutenants from the Royal Engineers, the ship’s crew of 20 and a good many women and children (ten of the latter born on the voyage). There were no convicts or pensioner guards on this voyage (4). Thomas was an Instructing Warder and during his eight years in Western Australia, he was assigned to convict depots Albany, York and Guildford – his role would be instructing, supervising and working on various public works. This was not always an easy task; working parties were not in chains and the number of prisoners was sometimes difficult to handle. For example at Albany in July 1854, Thomas was managing six white and seven aboriginal prisoners, the latter all absconded. (5). Booler was stationed at Albany from July 1852 to December 1855. Thomas was a miner by trade, but sappers often played the ‘jack of all trades’. Six weeks after Thomas arrived, the complement of 100 in the 20th Company was complete and comprised: 25 carpenters, 20 masons, 14 miners, 11 smiths, 7 painters, 8 bricklayers, 4 collar-makers, 4 tailors, 3 wheelers, 2 coopers and 2 buglers. (4,6). While Booler was stationed in Albany he met and married a young Irish girl; Honora Glynn was 20 years old when she married Thomas in 1853. They had two children early in their marriage: Thomas born 1855 and Mary Ann in 1857. Regrettably Mary Ann died in June 1859. The couple then moved to Guildford where another child was born in December 1859 (7). They were of the Catholic faith and ‘Emma’ was baptised as Emilia Eugenia on 8th Janauary 1860 less than three weeks before they sailed to England on the Lord Raglan with a total of 15 Sappers and Miners and their families (8). By 1860 Thomas Booler had been in the Army about 12 years – not long enough to entitle him to a pension as the 12-year ‘short service’ was not introduced until 1870. Nonetheless, he gained a discharge from the Corps and turned to a job in ‘civvy street’, changing his uniform in the process. 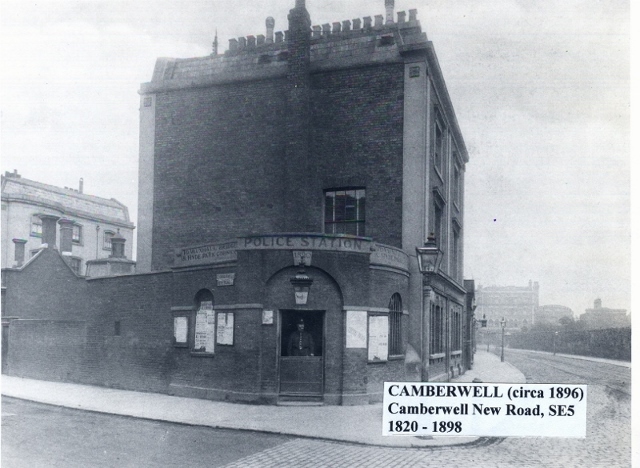 Thomas joined the Camberwell Division of the Metropolitan Police as a Constable in 1860 (Number 302 M). Unfortunately neither the ‘M Division’ register nor the ‘Joiners Ledgers’ have survived for that era. However, Police Orders of 9th January 1861 state that he was given a reprimand and a severe reprimand; and on 28th June 1861 he was fined one shilling and reprimanded but further details are not now available (9). When he resigned on 4th May 1862, he was given a certificate of conduct No 4, which is a reflection of having been in disciplinary trouble. During his time in the police force the family was living at 16 Queen Elizabeth Street, Southwark (10). 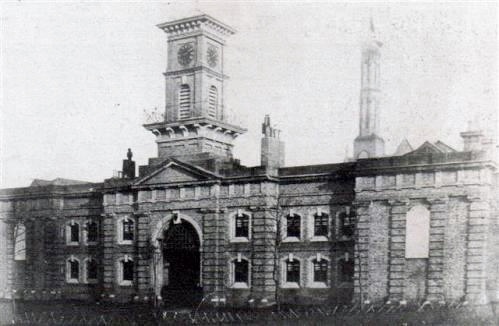 Thomas secured a position as Assistant Warder at Chatham Prison in May or June 1862. Almost immediately he started the process of applying for a position with the Convict Establishment in Western Australia. In 1862 the convict era had another six years to run and there would be opportunities for men with his experience. He quickly set about gaining proof of baptism so that his ‘evidence of age’ document could be signed by a magistrate at the Southwark Police Court (20th June) (1). In July he applied for the position of Assistant Warder. By September his position was confirmed with a salary advance of fifteen pounds. He was given a rail ticket from Chatham to Gravesend where, on 1st October 1862, he and the family embarked on the 427-ton ship Palestine for the trip back to WA (5). The Boolers may have been surprised to see a former 20th Company Sapper on board with his family – George and Mary Ann Bartlett and their twins; Bartlett was also on his way to a post with the Convict Establishment. They disembarked at Fremantle on 14th February 1863. Thomas and Honora Booler had no children during their two years in England, but upon return James was born in Fremantle (1863), William Beresford and George Alexander in Harvey (1865 and 1867) and finally Alfred John in Fremantle (1872). Thomas continued his work with convict parties in various parts of the State, but usually worked in the Bunbury to Harvey area. His Assistant Warder’s rate of pay would have been 52 pounds per annum increasing by one pound per year for each year of service. 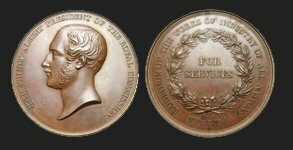 There were a number of other allowances in addition to salary available to warders: exertion money, good conduct, bush, lodging, rations, fuel and light allowances. The rules relating to allowances changed frequently over time. For the next 13 years Thomas had a long record of reprimands and fines for various infringements off-set by praise for his diligence from time to time (5). 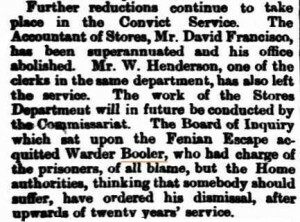 However, he was not forgiven for his unwitting part in assisting two Fenian prisoners to escape in 1876. 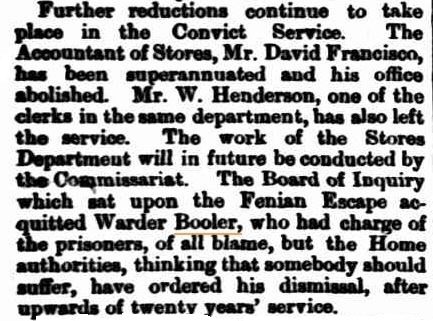 There was an enquiry into the Fenian Escape and he was exonerated at the local level, but in Britain his masters were unforgiving and demanded that he be dismissed. The escape by six Fenians on the American whaling ship Catalpa was a blot on the careers of a good many law-enforcement and servants of the public. Thomas was merely collateral damage (11). 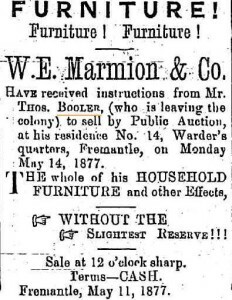 Following Thomas’ dismissal in 1877 the Booler family sold up (12) and moved to New South Wales where they settled in Glebe, a suburb of Sydney. Honora died in 1884 and Thomas died aged 81 at Campberdown, NSW in 1906 (13). (1) British Civil Service Evidence of Age Ref. 24272035. 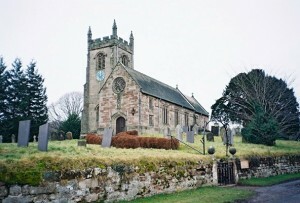 (2) Snelston Parish Church image courtesy of Berenice Baynham. (3) 1851 Census of England & Wales [HO107-1480-908-39]. (4) Muster Rolls & Pay Lists December 1851 [WO11-126]. (5) Dictionary of Warders & Gaolers, D J Barker. (6) Muster Rolls & Pay Lists January 1852 [WO11-130]. (7) WA Birth Marriage & Death Indexes. (8) Muster Rolls & Pay Lists January to March 1860 [WO11-172]. (10) 1861 Census of England & Wales [RG9-317]. (11) National Museum of Australia and Inquirer & Commercial News 16 May 1877. 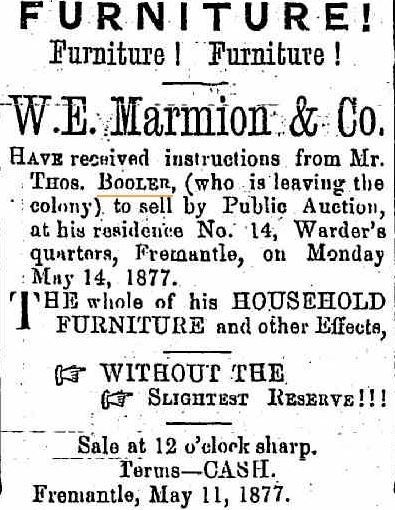 (12) Fremantle Herald 12 May 1877. (13) NSW Birth Marriage & Death Indexes.